The Morton Hotel London is a family run boutique hotel on the edge of the heart of central London. 34 bedrooms for a more intimate feel than offered by the many larger hotels in the surrounding area. Decorated with works of art and opulent furnishings while guests can relax in the Library Bar and Lounge. Certainly an excellent choice for anyone looking for value for money within walking distance of the main central areas. Guest rooms all have a classically elegant style. Bathrooms have a shower or a shower plus a bath, heated towel rails, bathrobes and under floor heating. Bedroom facilities include tea/coffee maker, free WiFi, air–conditioning, large screen TV with full range of SKY channels, radio, iPod dock, fridge, desk, table and chair or chaise longue, telephone, safe and hairdryer. An iron is available on request. Continental breakfast (includes tea, toast, breads, cereals, meats, cheese, fresh fruit and pastries) is served daily. Pay parking available in adjacent streets (Herbrand Street). Hotel has a lift. The bar area is located by reception. The Morton Hotel London has a concierge service. Complimentary wireless internet access throughout. Other services include laundry serves, cash machine on site, luggage storage. Nearest: Tube Station: Russell Square 105 yards (96 metres), Railway Station: London St Pancras Domestic 0.5 miles (0.8 km), DLR Station: Tower Gateway 2.4 miles (3.9 km), Motorway: M1 Junction 1 5.6 miles (9 km). This hotel boasts 5 tube stations with a half mile radius (0.8 km). Sitting in a very popular area for good value hotels is the Morton Hotel London. Just by Russell Square with great transport links and strolling distance from Covent Garden (0.5 miles, 0.8 km). This is a very busy area with plenty to see and do all around along with a host of shops and bars. The tube station of Russell Square on the Piccadilly line is right next to the hotel (2 minute walk) so fantastic for getting about in central London or further afield if your wanted to. Well placed for the mainline railway stations at Euston 0.4 miles (0.6 km) (10 minutes walk) and Kings Cross St Pancras 0.5 miles (0.8 km). Well served by bus routes and taxis passing through the area all the time. The local area is known as Bloomsbury which has a long history and lots of literary connections with a host of novelists (including Virginia Woolf and Charles Dickens), poets and play writers having lived in the area. The area was developed from the 1800's by The Russell Family which is where Russell square gets its name from. The University of London and Charles Dickens Museum located here. Several theatres close by and the famous Bloomsbury Cinema at Brunswick Square 246 yards (224 metres) away. This is as close to central London as you can get without paying the inflated central London hotel rates. 5 minutes walk from the British Museum. Other places of interest near to The Morton Hotel include The Fondling Museum 352 yards, (321 metres) Royal Academy of Dramatic Art 528 yards, (482 metres) British Museum 528 yards, (482 metres) Political Cartoon Gallery 528 yards, (482 metres) Bloomsbury Theatre 528 yards, (482 metres) Petrie Egyptian Archaeology Museum 0.4 miles (0.6 km), Shaw Theatre 0.4 miles (0.6 km), Conway Hall 0.4 miles (0.6 km), Dickens House 0.4 miles (0.6 km) and British Library 0.4 miles (0.6 km). Compared to other London hotels: This hotel has been rated 90% by past guests. The London average is 80% and the average for 4 star hotels is 83%. Therefore this hotel is above average for its sector (star rating) and for London as a whole. Imperial Hotels have an average guest rating of 71%. The Morton Hotel with its rating of 90% is therefore not just well above average for this chain but is our highest rated Imperial hotel. Milesfaster ranking: 266th from 866 London hotels, 1st of 7 Imperial Hotels, and 100th of 328 four star rated hotels. Another to Consider: A similar hotel nearby (0.2 miles, 0.3 km) would be the 4 star Montague On The Gardens Hotel, where rates start from £205 and which has a 98% guest satisfaction rating. The Montague On The Gardens Hotel also offers: free WiFi. As the Morton Hotel is a boutique style of hotel you might also be interested in the Grange Blooms Town House Hotel. This is also a boutique hotel and is (0.2 miles, 0.3 km) away. Rates start from around £75 and is rated by guests at 81%. We can also suggest a cheaper options nearby which would be the Britannia International Hotel. 4.6 miles from the Morton Hotel (7.5 km), has scored 68% from former guests and has rates from around £49 (theres free WiFi too). Howabout an alternative hotel that has scores higher in guest reviews? Then the 5 Star Marriott Grand Residences Mayfair ticks many of the right boxes being 1.5 miles (2.4 km) from the Morton Hotel. The Marriott Grand Residences Mayfair has a perfect unblemished customer rating 100%, a truly stunning achievement. 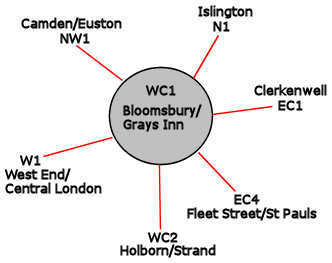 The closest fifty hotels around this area (2 Woburn Place, WC1 postcode) that are listed on this website cover a 0.5 miles (0.8 km) radius. The numbers for each star rating are 3 five star hotels (average rating 87%), 20 four star hotels (average rating 82%), 18 three star hotels (average rating 77%), 7 two star hotels (average rating 71%) and 2 one star hotels (average rating 62%). The highest rating in the isa goes to Montague On The Gardens Hotel (4 star) at 99%. Base Rates: We look at what the average base rates are for the area and by star rating. These rates do not take account of offers and short term deals so are just a guide. If we look at the average for all hotels in the area (nearest 50) we get an average base rate of £98 per night. The lowest rates are at £16 at Generator Hotel (2 Star, 77%) and highest base rates of £222 at Renaissance St Pancras (5 Star, 89%). Averages for each sector of star rating: Five Star average: £173, Four Star average: £119, Three Star average: £85, Two Star average: £56 and One Star average: £53. Royal National Hotel: is 116 yards (106 metres) away, has a guest satisfaction score of 60% and rates start from about £60. President Hotel: is 172 yards (157 metres) from here, earns a customer rating of 70% and base rates begin at about £62. Imperial Hotel London: 209 yards (191 metres), rated at 70% and with rates from around £69. Tavistock Hotel: 232 yards (212 metres), rated at 70% and with rates from around £58.